More than 100,000 comments supporting government regulation of the internet appear to have been automatically submitted by the Electronic Frontier Foundation (EFF), a left-leaning nonprofit, according to a forensic analysis published Wednesday. The responses likely did not come organically from real people, which the Federal Communications Commission’s (FCC) forum for public comment on net neutrality is intended to be for, according to The National Legal and Policy Center (NLPC). 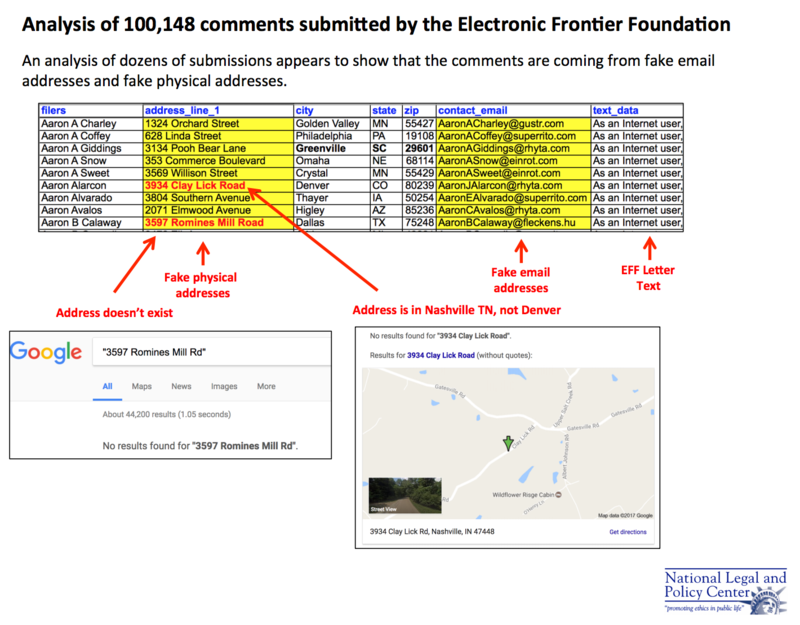 Rather, the NLPC claims the comments seem to be artificially submitted by the EFF since language used is highly similar to EFF’s submission platform and both the email addresses and the physical addresses of the listed people are fake, or don’t exist. The organization also suspected the potentially feigned support for net neutrality by browsing through 100,148 comments and deciphering that they all contained a suspiciously large portion of language that was used in the EFF’s submission platform. The EFF, though, offers “rotating variables” meaning there are options for certain words to make the comments look different. 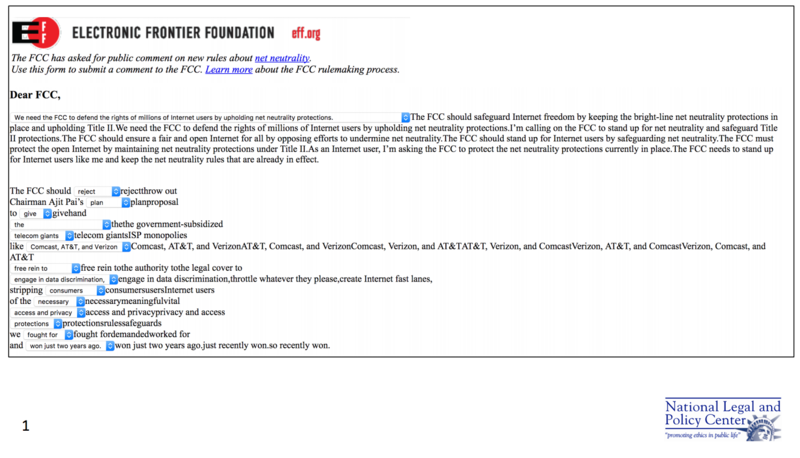 “The FCC should [reject/throw out] Chairman Ajit Pai’s [plan/proposal] to [give/hand] [the/the government-subsidized] [telecom giants/ISP monopolies]…” reads the EFF’s template for public comment, according to the NLPC’s screenshot. The submission platform also gives options for which corporations to call out and in what order. The NLPC alleges that the EFF subtly changes its rotating variables once the web page is refreshed. The Daily Caller News Foundation (TheDCNF) did its own analysis of the FCC’s forum for public comments and found that hundreds of thousands of posts supporting net neutrality are likely fake. After calling 10,000 people listed as “pro-net neutrality” commenters, only 44 percent answer “yes” when asked if they could recall submitting a public comment supporting the regulations imposed by the FCC under the Obama administration. Thirty-nine percent denied having submitted a comment or were unable to remember, while roughly 17 percent declined to answer the question. 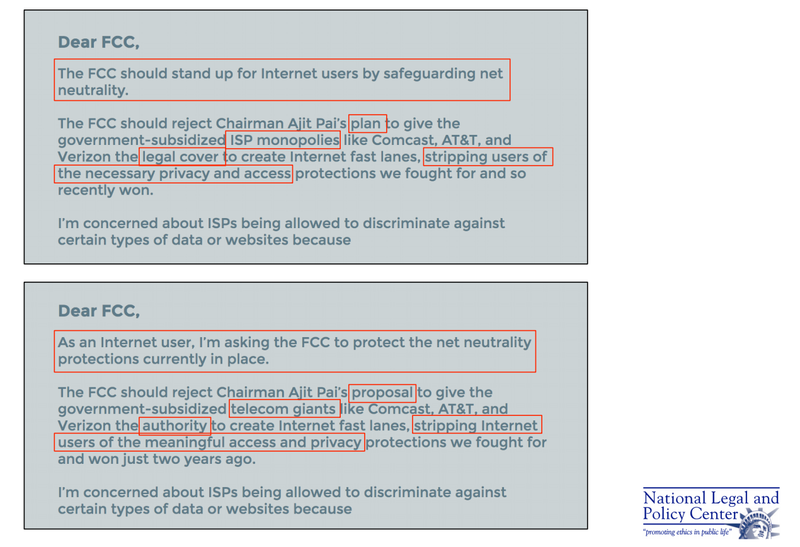 As noted in TheDCNF’s original report, fake “anti-net neutrality” comments also made their way on the forum as more than 128,000 identical posts under different names were discovered, according to ZDNet.